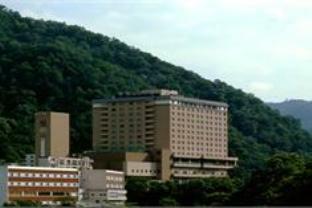 Hotel Milione is a Japanese onsen hotel that sits in the middle of the very popular Jozankei onsen area in the southern edge of Sapporo, Japan. A giant, brick rectangle, Hotel Milione isn't much too look at from the outside, however once you enter the large, western style lobby you're greeted by a shiny gold interior, accented with 8 meter ceilings, giant chandeliers, and antique furniture. But it's still a modern ryokan, so juxtaposed to the glamour of the lobby you'll also find many of the guests wandering around in traditional Japanese yukatas, or robes. 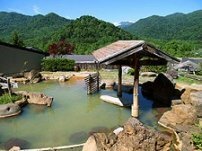 The hotel offers many amenities, among them: japanese style tatami rooms outfitted with futons, bars, restaurants, karaoke booths, a night club, and Jozankei's claim to fame: it's natural hot spring baths, or onsen. Once you get into your room it's standard procedure to change into your yukata and spend the rest of your stay wearing just that. The hotel provides you with everything you'll need for your stay: toothbrushes, razors, towels, slippers, the whole nine-yards. You can leave everything at home. 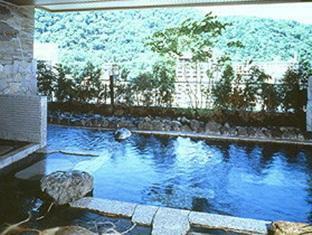 Most guests will head out to the onsen followed by dinner followed by drinking. There's only segregated baths, with the usual blue curtain for men, red for women. The bath area has about four or five different baths, differing in temperature, including a jacuzzi, cold bath, and rotenburo, or outdoor bath. The rotenburo has beautiful views of the mountains surrounding the Jozankei area. It's all very modern and luxurious. For a regular tatami room, for four people, you'll spend around ¥5,200 for each person. This includes one night at the hotel, use of the onsen bath , an amazing kaiseki dinner, and a very good japanese/western style breakfast buffet. Keep in mind alcohol is not included with dinner, and it's surprisingly expensive. However, across the street is a liquor store if you want to continue the night socializing in your room. There is also a free, round-trip shuttle bus to and from Sapporo Station Bus terminal, one-way takes about an hour. Book online for discounted rates.